Viral RNA polymerase (PB1, PB2 and PA) transcribes one mRNA from each genome segment. Transcription is primed by cap snatching. mRNA are polyadenylated by the viral polymerase stuttering on a poly U track. M and NS mRNA can be alternatively spliced, giving rise to mRNA coding for BM" and NEP proteins. NB is translated by leaky scanning from the NA mRNA. 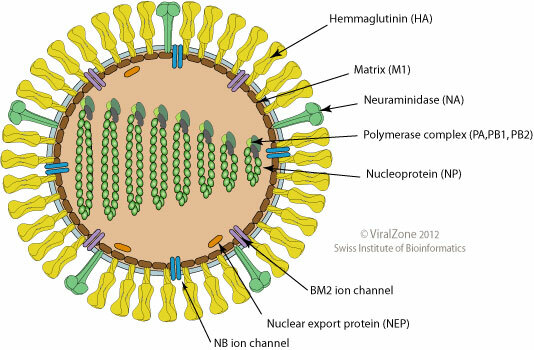 Influenza B virus inhibits the cascade leading to production of interferon-beta by targeting different cellular proteins. NS1 inhibits host ISG15 activation as well as PKR.